Violations are either critical or non-critical. Critical violations, which are more likely to contribute to food contamination, illness or an environmental health hazard, include inadequate cooking of food items or poor personal hygiene. • Chubby’s Pizza and Dairy Point, 604 N. Broadway St., Blanchester, 6-11-15, standard. Utensil found in closed container of tuna salad. Ice cream toppings and sauces missing labels. Ice cream scoop for hand-dipped ice cream found in a cup of water, but a supervisor corrected the issue. A light wasn’t working in a reach-in cooler. Door seal on pizza make table was damaged. Water condensation from ice machine was leaking into an overfilled pan. Wood shelf next to shake mix machine was missing paint. Grease accumulated on fryer. Food accumulated under pizza cut table, microwave, between pizza cut and order table and floor next to pizza oven. Food contact surfaces not sanitized. Drain lines weren’t air gapped. Lid missing on restroom trash can. Floor tile missing under soft serve machine. Light bulb not working in ceiling fixture. Maintenance tools stored next to slicer. • Majestic Springs Golf Club, 1631 Todds Fork Road, Wilmington, 6-11-15, standard. Ice-making machine had pink residues on inner guard. Microwave has food splatter on it. • Kirkwood Camp and Conference Center, 5719 State Route 73 West, Wilmington, 6-11-15, standard. Jar of home-canned relish in cooler. 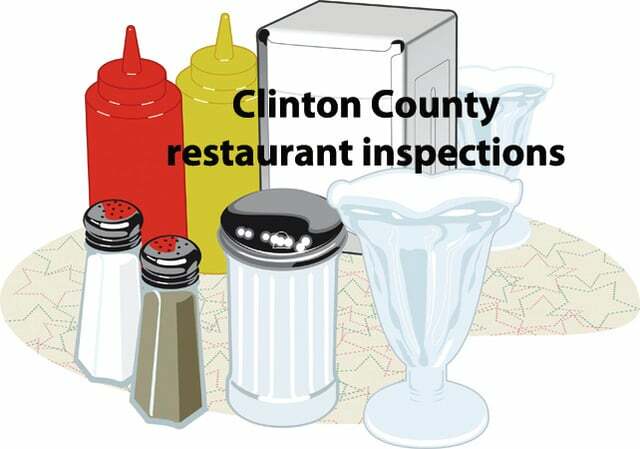 A supervisor believed the relish belonged to the license holder and wasn’t in use at the restaurant. Staff member peeled cucumber with bare hands; supervisor corrected. Raw ground beef and raw chicken stored in same pan; violation corrected. Taco meat and chipotle chicken was date-marked June 4; violation corrected. Debris/residues observed in ice scoop holder, slicer cart, stand mixer and microwave; violation corrected. Ceiling lights not working in some areas. Floor material in back room damaged. Extra cleaners and unrelated kitchen supplies stored on drain board of three-compartment sink. Insects noted in back room of kitchen on floor and on a thermos cooler; cooler removed. • #1 China Buffet, 1587 Rombach Ave., Wilmington, 6-9-15, standard. Employee beverages found with no lid on prep cooler across from wok. Seasonings missing labels. Sweet and sour chicken, egg roll, watermelon and sausage mushroom wasn’t stored cold enough, and sushi rice wasn’t hot enough. Black residue observed on inner guard of ice-making machine. Residues noticed on top of can opener. Residues noted on door seals of prep coolers. Lid to dried noodles has food residues. Soft serve machine cleaned once per week. Trash cans have food residues on sides and handles. Aloe Vera found at prep table. Floor tile missing trim. • Flagway, 373 W. Washington St., Sabina, 6-9-15, standard. Light bulb missing in beverage reach-in cooler. Lightbulb ceiling fixtures missing shields or are not shatter resistant in food zone areas. • Traditions Restaurant and Catering, 78 N. Howard St., Sabina, 6-9-15, standard. Sliced ham, sliced tomato, mayo and Benny Sauce wasn’t stored cold enough; a supervisor moved the products to other coolers and adjusted temperatures. Date mark missing on coleslaw, to-go sides, lunch meat, etc. Chicken residue observed on bottom of raw meat cooler. Black residues noted on guard in ice-making machine. Cheese, crumbs, etc. noticed under and behind lids on top of sandwich prep coolers. Keys, phone and wallet found on prep table. Light bulbs not working above steam table. Floor tile damaged under warewash machine and in front of sandwich prep cooler. Black debris observed in mop sink. • Cluxton’s Dairy Bar, 267 W. Main St., New Vienna, 6-8-15, standard. Boxes of mayo on floor in storage area. Box of tomatoes on floor in kitchen. Floor tile in walk-in cooler chipped/damaged. Floor paint missing/damaged in front of soft serve machine. Spray bottle with cleaners missing label. • 4-H Camp Graham, 164 Springhill Road, Clarksville, 6-4-15, standard. Light bulb not working in vent hood. • Cowan Lake State Park, 1756 Osborn Road, Wilmington, 5-29-15, standard. Boxes of canned tomatoes and to-go containers stored on floor. Food debris accumulated in microwave.